Keurig vs Tassimo: Which Single-Serve Coffee Brewer to Choose? Over the past decade the coffee industry has experienced a drastic change. Namely, we witnessed the emergence of single-serve pod coffee brewers for home and office use. Statistics show that 40% of Canadian families use this kind of machine in their homes now and that number is only going to continue to grow as time goes on. Why would you buy a single-serve coffee brewer? Why do so many families today? The answer lies in the pros and cons of this technology in which the portion of coffee you place into the brewer has already been selected and pre-packaged for you. No spillage of coffee grounds all over your counter. Specialty drinks (e.g., mokaccino) at the press of a button. Faster than most regular brewing machines. No need to brew an entire carafe when you only need a cup of coffee. Significantly more expensive on average for each cup of coffee. Environmental impact of non-recyclable pods. In short, it’s a battle of convenience vs cost. In the past decade, we’ve collectively decided that convenience was worth the extra cost. Coffee producers rejoiced at our choice, as they managed to get us to pay up to five times more, gram per gram, for the same amount of coffee. How did we come to accept this compromise? Our tolerance for expensive coffee has changed. Brewing coffee at home was dirt cheap. A cup of coffee bought from your trusty java joint also used to be very affordable. $1.00 or less a cup, cheap. Then Starbucks happened, and it’s now socially acceptable to charge $4–5 for a cappuccino. In all fairness, it was served to you by a guy with a degree in English Literature. So while yes, your single-serve pod is still five times more expensive than the dime you’d spend per cup with a traditional brewer at home, compared to the alternative of grabbing a coffee on your way to work, it looks appealing and even downright inexpensive. As an Italian, born and raised, I’m passionate about coffee. I own three machines, a fancy espresso machine, a Kitchen Aid brewer, and recently, just in time for the holiday season, a single-serve pod coffee brewer. Guess which one I use all the time? That’s right. Convenience wins out over price, unless the price is so high that it starts impacting your ability to buy necessary things in life. Making coffee used to be a potentially messy and somewhat time-consuming chore. Now however, whipping up a cup of joe takes no more time or effort than inserting a pod and pressing a button. Quick, easy, satisfying. So despite its cons (chiefly cost per cup), I would absolutely recommend that you buy one of these magical coffee makers. Having established that you want to buy such a brewer, which brand should you go for? In order to best answer that question, I prefer to talk about systems, rather than individual machines. 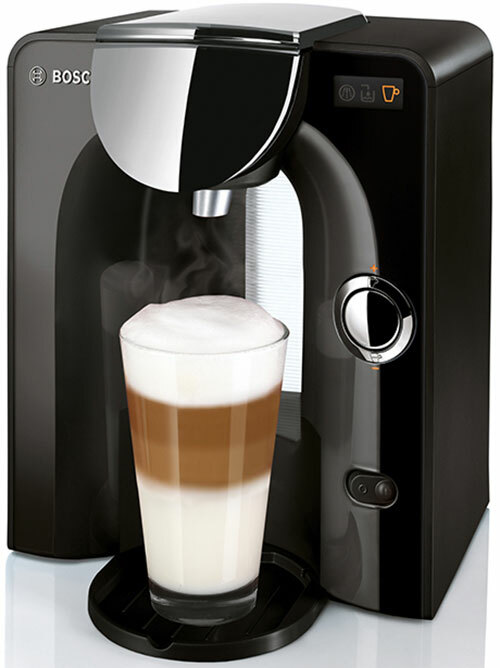 Two such systems – the main competitors in this market really – are Keurig and Tassimo by Bosch. Keurig is the leader (40% market share), and Tassimo is the second place runner-up (25%). Keurig makes a few different types of pods, depending on the machine that they are intended for use with. The most commonly known is the original K-Cup, which is a plain pod that’s fed to the brand’s non-espresso brewing machines. It could (and can still be) be fed to licensed third-party machines as well, such as the excellent Cuisine Art, Breville, and Mr. Coffee options. Keurig themselves have created a vast variety of such K-Cup pods in collaboration with other brands of coffee makers. Numerous third parties began producing them as well, without being directly involved with Keurig. The whole ecosystem is huge. If you buy a brewing machine that’s able to accept the original K-Cup pods, you’ll have a virtually unlimited amount of choice in terms of coffee, specialty drinks, and tea pods to feed it. Okay, so why are we even talking about Tassimo here? Well, Keurig didn’t really like that arrangement. They didn’t like the idea that third parties could make their own pods. They wanted to profit off each individual coffee that was ever made in one their machines. As a result, Keurig 2.0, a new system of K-Cups arrived on the scene (they now have K-Carafe pods to brew larger quantities of coffee, too). These new K-Cups differ from the original ones because of the addition of a barcode on their lids. The newer Keurig 2.0 K-Cups. Note the white border. In theory this is a good idea. The barcode of sort (which doesn’t look like a bar code) tells these intelligent machines exactly how a particular pod should be brewed, resulting in better tasting coffee, cappuccino, or cup of tea. In practice however, it means that if you buy one of the new Keurig machines you won’t be able to use all the original K-Cup pods that are available on the market at the moment (those that are sans barcodes, I mean). Instead you’ll be forced to stick with Keurig 2.0 K-Cups. 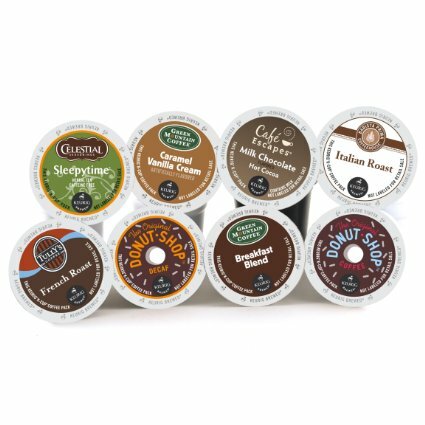 The selection is decent but nowhere near as vast yet as that of the original K-Cups. In addition, so far at least, unlicensed third parties won’t be able to produce their own new K-Cups. And of course, the new K-Cups also cost more than the old ones. Keurig is really taking a page from the printer manufacturers’ playbook (as they’ve been giving you printers for a song for ages now, but charging you a small fortune for the ink). Depending on your stance, you might find all this par for course – or you might be outraged. 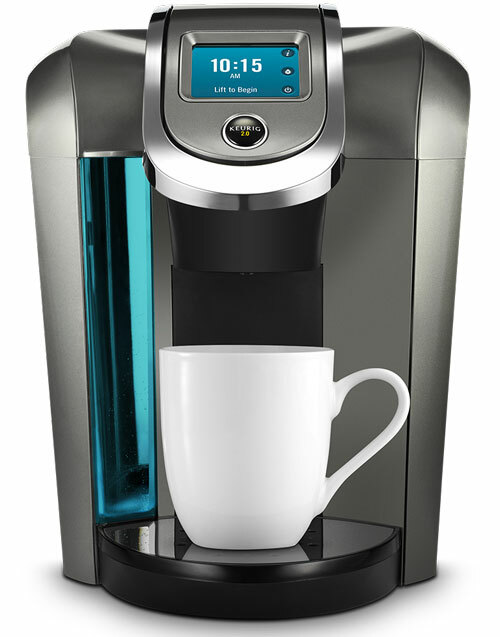 The K500, a top of the line Keurig 2.0 brewer. If you look at the reviews of new Keurig machines you’ll find that they are full of one stars. They are political one stars from people who are pissed that they bought a new machine and realized that they can’t just grab any K-Cup at the supermarket. They can’t use their own coffee through refillable pods either. 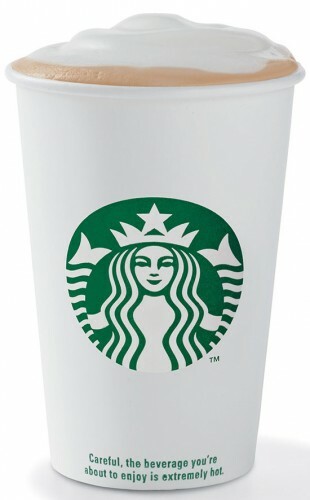 They need to buy the more expensive ones with a white border instead (i.e., the Keurig 2.0 K-Cups). The third choice would be Tassimo. Tassimo uses a system that they call T-discs, which also happen to utilize bar code technology. Unlike Keurig, there is no 1.0 and 2.0 at the moment. These pods are only available for Tassimo machines, but will work with any model of machine from this brand. The selection is decent,  and there is definitely more than enough drink choices to satisfy most people’s tastes. That said however, the variety is objectively inferior to that of Keurig (the original system). The flatter, wider T-Disc by Tassimo. Smaller footprint. Counter space is at premium in my kitchen. Quieter and faster than Keurig. Coffee brewing starts immediately with Tassimo. 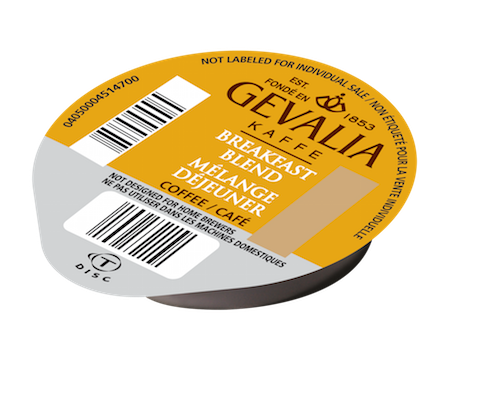 T-discs tend to be cheaper than Keurig 2.0 K-Cups. Tassimo comes with a water filtering mechanism that introduces another cost (for the filter replacements), but should aid with the purity of your beverage. I did a comparison tasting and found the taste of Tassimo to be much closer to that of gourmet coffee. Less selection, though each one I’ve tried so far has been excellent. With Keurig it’s hit and miss. Perceived to be of better build quality. 2 year warranty in North America, instead of the standard 1 year. Currently significantly on sale. I got mine for $90. Bosch Tassimo T55. My choice. There you have it. I’m extremely happy with my choice, but either would likely serve you well. 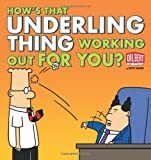 I just wanted to give you more insight before you commit to one system or the other. Despite my SLR kit, over the course of the past few years, I really haven’t taken many pictures. Lately as well, I’ve been reflecting on the fact that I have relatively few photos of my wife and I together over the course of our lovely, happy six year marriage. I realized that no matter how good one’s equipment is, you can’t take the shot unless your camera is actually with you. And the truth is that between the monetary value of the equipment I possess and its bulk/weight, I only take my DSLR out of the house when I’m on an occasional photographic mission (aka, outdoor shooting session). The value of the image quality provided by a DSLR with good glass is not lost on me. But owning such great equipment has paradoxically led me to take fewer and fewer pictures over time, thus I end up missing out on the opportunity to spontaneously document life as it occurs. For this reason, I decided that it was high time for me to buy a compact camera that I’d be able to have on me all the time when I’m out and about. Experience has taught me that I will gladly trade the flexibility, speed, large sensor size, and image quality of an interchangeable lens system for the portability of a high-end compact digicam that can hang out in my coat pocket at all times. I will definitely still use my DSRL kit for situations when a photographic shooting session has been planned (if I’m taking pictures of a friend who volunteers as a model, etc…) or when it’s convenient to do so (such as when I’m shooting at home). I did a lot of research on the topic of compact digital cameras so as to update my knowledge on the latest models that are available on the market, and as such I thought I’d share some of what I’ve learned with my readers in this post. I really hope that the info provided here will be of help to you if you’re also contemplating getting a compact digital camera for yourself or a loved one. My main concerns when selecting a camera were common ones: portability and price. I don’t want to carry a $700-1000 camera on me most of the time, nor was I interested in an SLR-like super zoom (sometime called ZLR) that would hardly fit in my pocket. For the most part this ruled out great μ4/3 cameras, which are a compromise between a compact camera and a DSLR. I find such systems (like the Sony Alpha NEX-3) to be outstanding, and think that their popularity will continue to skyrocket as more people start realizing that SLRs are fun but not always very convenient to actually tote around with you. Though I was tempted by this type of camera, in the end it was outside of my comfort zone both in terms of size (it’s a tad too bulky for my intended purpose) and being able to fit into my budget. High-quality, fast optics: I wanted a camera with rapid autofocus and the ability to handle a variety of photographic scenarios, including low light situations. Image Stabilizer (IS): Lens-based image stabilizers can really help achieve sharp images at lower shutter speeds. As I may not always have a tripod with me this point is important. Larger sensor than the average compact camera: Generally speaking this leads to better images and less noise due to the lower pixel density on the sensor (assuming the same megapixel count is applicable). Good usable ISO range: Photography means painting with light; a camera with a usable 800 ISO may make the difference between getting a shot in low light and missing out on capturing it completely. Full manual control: Sometimes the camera knows best, other times I need to be in control of all the parameters that define the exposure. Support for RAW files: JPEGs are fine for most shots, but RAW files afford me post-processing flexibility when I need to save a photo or really make one shine. An excellent wide-angle: Unless you are spying on your neighbors or attempting wildlife photography with a compact camera, you’ll find that a good wide-angle range is often far more important than having an extreme zoom. Given the choice, I would happily trade 100mm on the telephoto side for 10mm gained on the wide-angle side of the range. Good macro support: Most compact cameras do a good job in this regard already, but I was definitely looking for a camera that would include this handy feature. Support for HD video: Let’s not kid ourselves here. I’m not going to shoot Avatar with a pocket camera. It would be nice however to be able to shoot the occasional movie clip and do so in HD format with decent results. No more than $400: This was the budget I set for my new camera. Note: I don’t care about marketing gimmicks like total megapixels (anything above 8 megapixels is plenty if you need to print enlargements). Based on the criteria above, I shortlisted the following enthusiast/premium/prosumer/pro (10Mpx) digicams. In truth, these are some of the best cameras on the market, regardless of price. This camera stands out for being extremely compact (it’s so compact that it fits into a shirt pocket). It has a 1/1.7″ CCD sensor and can shoot 720p @ 24 fps movies with stereo sound. The embedded lens is a bright, fast IS 28-105mm (in 35mm terms), f/2.0-4.9. It supports RAW files, has a good ISO range (80-3200, which is very usable up to 800), and its JPEG processing is fantastic. On the downside, it lacks a viewfinder or the hotshoe for an external flash (however Canon provides the option to use the camera to trigger a wireless flash that’s sold separately). The LX5 is larger than the S95, though it still remains comfortably pocket-sized (especially if we are talking about a jacket pocket). It has a slightly larger sensor (1/1.63″ CCD), which is unique because it allows for four types of aspect ratios that can be switched by moving a dial on top of the lens (4:3, 3:2, 16:9, and 1:1, respectively). Different pixels are actually “exposed” depending on the aspect ratio, so this isn’t just a gimmick that’s equivalent to doing cropping via image editing software. This camera has a fast IS Leica lens and comes in at 24-90mm, f/2.0-3.3. The telephoto end is shorter than the S95, but it provides a much better wide-angle and a brighter lens (f/3.3 at 90mm). The ISO goes from 80 to 12800 (it’s extremely good up to 800). This camera can record very good quality movies at 1280 x 720 pixels @ 30fps, allowing you to customize the exposure much like you can for a photo (you can also zoom during recording). As well this model has a dedicated button that allows you start recording video immediately (note that the audio quality is reported to be less stellar than that of the s95). Unlike the s95 however, the LX5 has a hotshoe and an external flash (which can be purchased separately), as well as an optional viewfinder (optical or digital). The JPEG processing is arguably not as good as that of the S95, but processing RAW files with the LX5 leads to great images. Lastly, the battery lasts longer than the S95 with an average of 400 shots per battery charge (versus 200 shots for the S95). The EX1 is the bulkiest of the group, at almost double the weight (356g) of the S95 (193g). It still fits into a coat pocket – but we are stretching the definition of “compact” a little bit. However, it has the fastest lens of any compact camera (with a stunning image stabilized 24-72mm f/1.8-2.4). The sensor is the same size of that on the S95 (1/1.7″ Type CCD), with an ISO sensitivity of 80-3200 (like the previous two cameras, this model shines up until an ISO of 800). The EX1 lacks HD video (480p @ 30 fps) and its RAW files don’t appear to be currently supported by Mac OS X programs. People have also reported issues with the built-in metering system (which appears to be a bit inconsistent). On the plus size it’s excellently built, with good manual controls and a decent battery life (250 shots). Though it’s admittedly out of its league in terms of this shortlist, I wanted to mention the Panasonic Lumix DMC-ZS7 as well. It’s more of a “travel zoom” than a prosumer camera, but the presence of a large, relatively fast zoom, GPS, and its significantly lower price point (it’s currently on sale for $239) made me give this camera some thought. As well, I didn’t include overviews of the Nikon Coolpix P7000 or Canon G12 here because they’re both slightly out of budget and are far too bulky for my intended purpose (despite remaining excellent choices if you’re fine with a slightly larger compact camera). Overall the three cameras above all produce excellent images given their compact size. You really can’t go wrong with any of these powerhouses. I personally decided that in the end, I wouldn’t be happy without HD video and as such decided to give up on the idea of purchasing the Samsung model. That left me with the choice of picking between the S95 and the LX5, which was anything but an easy task! I love the super compact nature of the S95, its JPEG processing, and manual focus ring. However, the LX5 arguably had the edge on a feature-by-feature basis, so in the end I went with the Panasonic Lumix DMC-LX5 (on sale for $399) over the S95, and am now sincerely looking forward to using this terrific compact digicam. Disclaimer: Please note that the links to Amazon contain my referral id. Clicking on them won’t cost you a cent and you can think of doing so as a way of tipping me for writing this article if you buy something as a result of it.